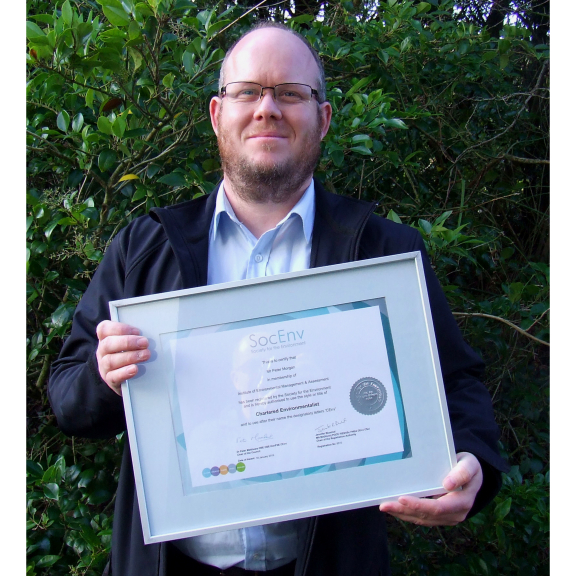 Pete gained the prestigious award through the Institute of Environmental Management & Assessment; the Chartered Environmentalist qualification is governed and run by the Society for the Environment. Pete: “Being a registered Chartered Environmentalist recognises that I have reached a certain level of knowledge both within and beyond my experiences at the Zoo. It demonstrates competence within and a commitment to environmental best practice. Pete is thought to be the first person from a zoo to become a Chartered Environmentalist and the only professional with a CEnv qualification working in a British zoo. IEMA has nearly 1,000 current Chartered Environmentalists. The Institute of Environmental Management & Assessment (IEMA) is the professional body for over 15,000 environment and sustainability professionals from around the globe. Their role is to support individuals and organisations to set, recognise and achieve global sustainability standards and practice. Chartered Environmentalist (CEnv) is a professional qualification that can be applied across all sectors. It provides a respected benchmark for individuals working to mitigate and solve environmental challenges. The Society for the Environment is a not-for-profit umbrella body which brings together professional institutions from different sectors and licenses them to award the qualification Chartered Environmentalist (CEnv). Paignton Zoo Environmental Park is a registered charity. For more information go to www.paigntonzoo.org.uk or ring 01803 697500.